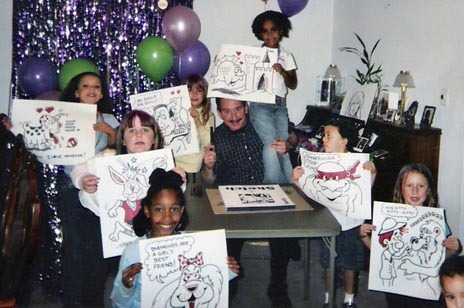 "Cartoon Parties" Talented artists are members of our nationwide team. We come to your event! Evening Rates any $145ph Overtime: Hour(s) over initial agreed upon time. Billed per hour at same hourly rate. or email photo and/or idea for a quote to create an individual art piece. We offer talented CARICATURE ARTISTS who draw faces, themed backgrounds and bodies, sideviews, personalized cartoons & couples. Children and adults of all ages enjoy a one of a kind experience getting a gift of art that best fits their very own charm and dreams. Great option for parties, company events and school functions. Contact Carmen Tellez 562-237-3327. A creative, educational, artistic, fun and interactive event! After the party is over, you can make copies of your cartoon so your child can color their very own cartoon image over and over again without destroying the original. Subject to an additional fee to include mileage or special setup instructions. No special permits or insurance needed. Talented artists are members of our nationwide team 877-725-6967.